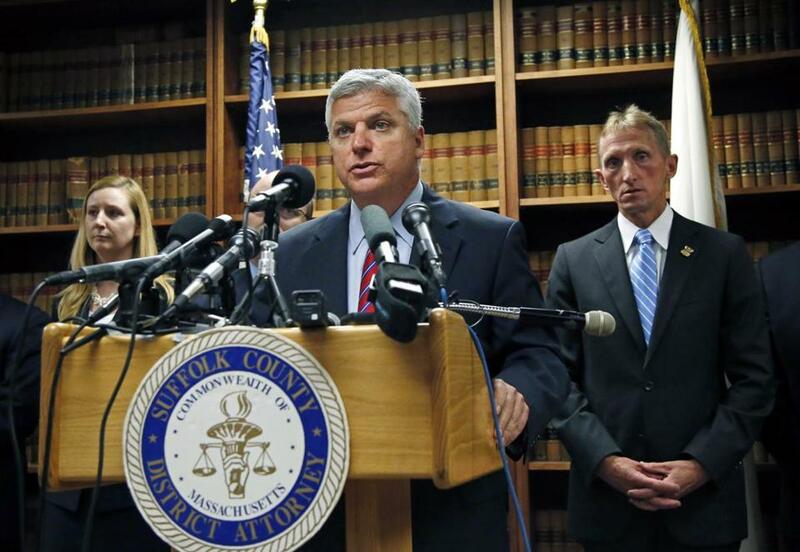 Suffolk DA Daniel F. Conley’s comments came Friday during an address to the American College of Physicians in Boston. Suffolk District Attorney Daniel F. Conley endorsed a slate of gun violence prevention strategies Friday, including universal background checks, restrictions on civilian use of military-style assault weapons and large-capacity magazines, and more research into gun-violence prevention, during an address to the American College of Physicians in Boston Friday. The article notes that 32,000 people each year die in America as a result of firearm-related violence, suicides, and accidents, and lays out a series of recommendations. It calls for background checks to be a universal requirement for all gun purchases or transfers of ownership; improved access to mental health care; restrictions for civilian use on the manufacture and sale of large-capacity magazines and firearms; and research on the causes and consequences of firearm violence. It calls for legislators constructing reporting laws that compel health professionals to report patients showing signs of violence to do so in a thoughtful way that protects confidentiality and does not deter people from seeking help. And it opposes state and federal mandates that forbid physicians from discussing gun ownership with patients, noting that physicians must be allowed to speak freely with patients about health and firearm safety. Signatories to the article, published in February, include several national physician groups, the American Public Health Association, and the American Bar Association. On Friday, more than two dozen organizations joined them in officially endorsing the policies, including the Children’s Defense Fund, the National Coalition Against Domestic Violence, the National Urban League, Sandy Hook Promise, and the Violence Policy Center, according to a press release. The majority of Boston’s victims of gun violence are young black and Latino men from low-income communities, Conley said, and their murders — often committed outdoors by assailants that leave no fingerprints or DNA — are statistically the most difficult to solve. “From an investigative standpoint, we’re looking at a simple equation: fewer available handguns equals fewer homicides solved at a greater rate,” said Conley. The strength of a state’s gun laws correlates directly with its rate of gun-related deaths, said Conley, citing a study by the Journal of the American Medical Association, and Massachusetts tops the list with high legislative strength and low rates of gun fatalities. However, he said, only 27 percent of the more than 1,500 crime guns recovered statewide in the last year came from Massachusetts: Lax gun laws in neighboring jurisdictions, Conley said, undercut the laws in the Commonwealth. He called for a comprehensive strategy to reduce gun violence, including medical and mental health components, research, and a public perception campaign to reduce gun violence. He pointed to one such grassroots campaign: Operation LIPSTICK, which stands for Ladies Involved in Putting a Stop to Inner City Killings. The women who run LIPSTICK target young women who are susceptible to being recruited into making straw purchases of guns later used in crimes. Conley sent prosecutors out with LIPSTICK workers to talk to women in beauty parlors, nail salons, and other places where women congregate to talk about the effects of gun violence and the legal consequences for women who buy, carry or store crime guns. “The result was a reversal of a rising trend of female defendants charged with weapons offenses,” said Conley. Between 2011 and 2013, according to data from his office, gun prosecutions fell 9 percent overall but among women, they fell by about 30 percent. “Consider what we might gain from the combined effect of sensible legislation, properly funded medical and statistical research, and a national public awareness campaign like the one we ran here in Boston,” Conley said.